Below are the requested supplies for the 2016-2017 kindergarten school year. If at all possible, please have the supplies on or before Tuesday, September 6th. Don’t forget to write your child’s name on his/her backpack and lunchbox! A continuación les presentamos la lista de utiles del Jardίn de Niños del ciclo escolar 2016-2017 si es posible que tenga listos lo utiles el o antes de martes 6 de septiembre. ¡No olvide escribir el nombre de su hijo/a su mochila y a su lochera! On Monday June 13, Kindergarten students were treated to an assembly that had them laughing, listening, singing, and dancing! 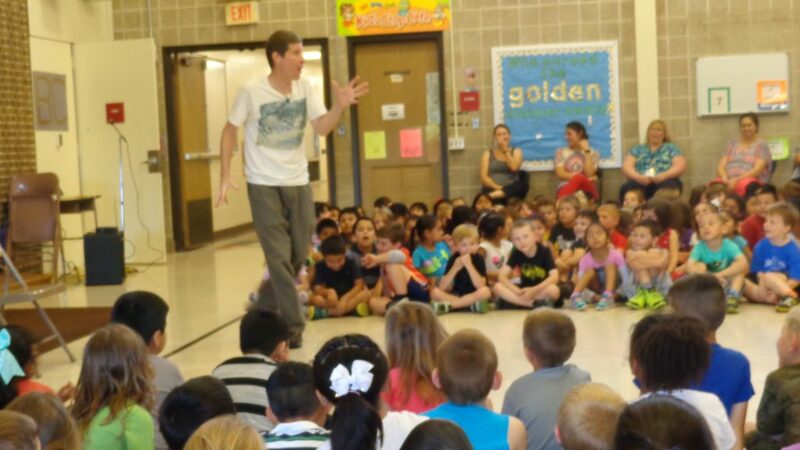 Clem Bowen, singer and storyteller, brought his exciting stories to Mary D Lang Kindergarten Center to round out a fantastic kindergarten year! Mr. Bowen played enthusiastically played instruments and told stories that kept the students (and adults) engaged. When Mrs. Jeri Ramagnano told her students that they were having a baby shower for baby birds/critters, they didn’t hesitate! Students brought in paper towels, toilet paper, Lysol, Ziploc bags, cotton balls, distilled water, unflavored Pedialyte, and rubber gloves. The baby shower was held by Wild Birds Unlimited of Hockessin, DE. The Tri-State Bird Rescue and one individual, Hillary Taylor, take in orphaned and injured birds and other small critters and rehabilitate them. They care for these animals until they are able to take care of themselves. When the animals are able to feed themselves again, they are released back into the wild. The supplies that the students donated will help the staff and volunteers care for the animals. 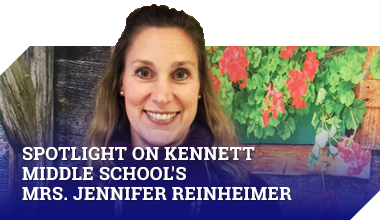 The Kennett Consolidated School District is asking parents and guardians of students at Mary D. Lang Kindergarten Center to give the District feedback on their overall experience this year. We look forward to your honest feedback and thank you for all of the support you have provided this year. Please find the links below and encourage others to participate in the survey. 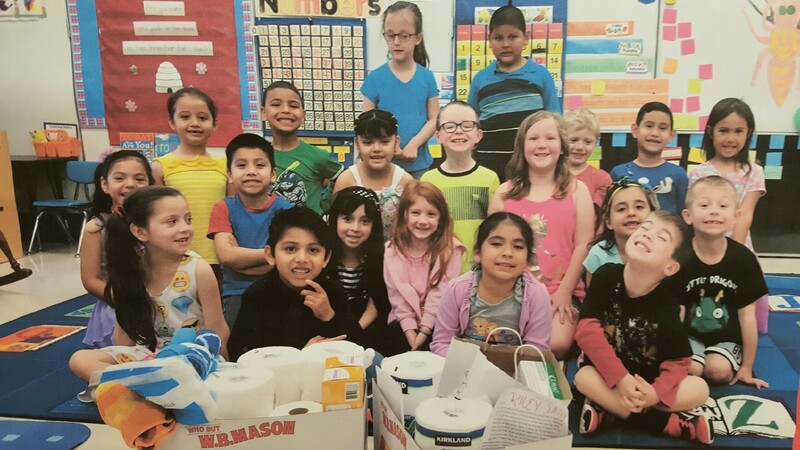 Two students in Mrs. Jeri Ramagnano’s kindergarten class have done something phenomenal. They wrote their own chapter books. During the week, students were given time to write on their own about a top of their choice. They created a front cover, illustrations, and chapters. If you want to know anything about volcanoes or who works, the two girls pictured below have written books on the topics! Everyone at Mary D. Lang Kindergarten Center is very proud of the students’ hard work and creativity. Counting Down in ABC Order! That doesn’t sound right, or does it? At the Mary D. Lang Kindergarten Center it makes perfect sense! Starting Tuesday, May 10, students will begin counting down their awesome year of kindergarten using the letters of the alphabet! 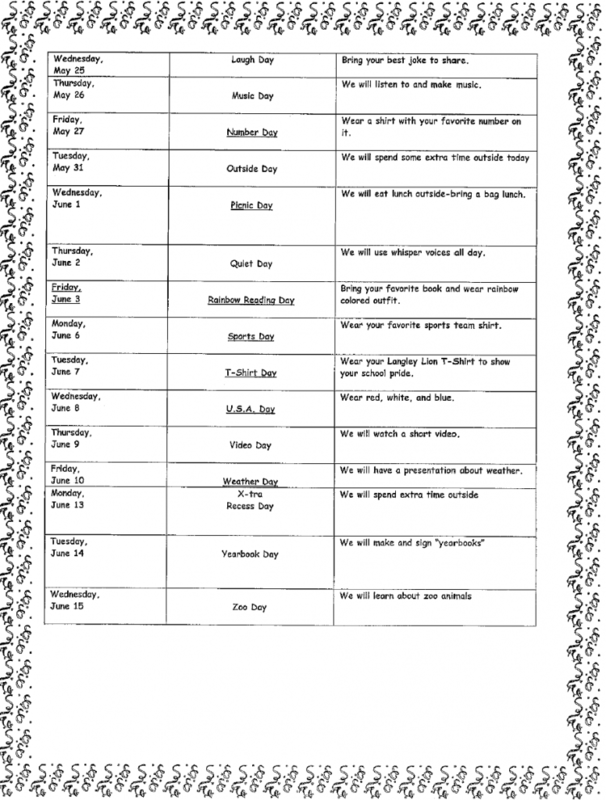 The School Spirit Committee created a calendar of events that corresponds to a letter of the alphabet. 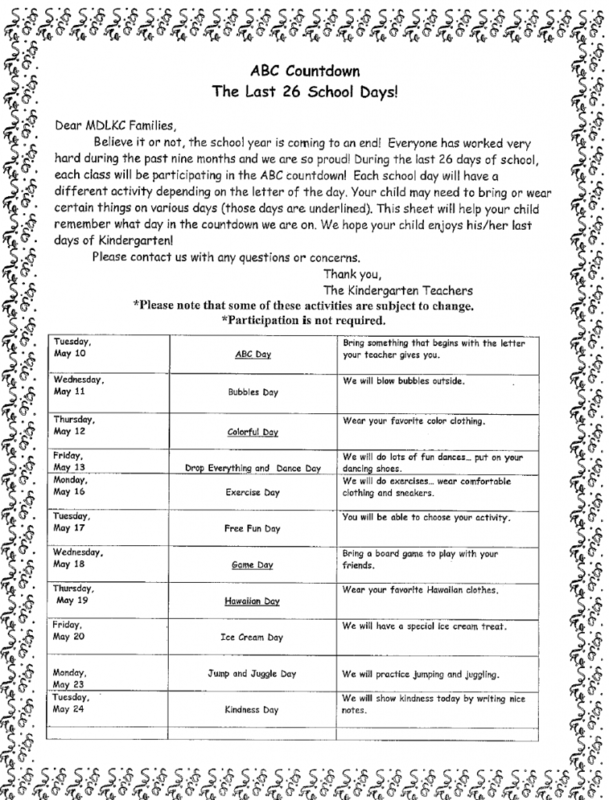 The students have worked so hard this year that the teachers want to make the end of their kindergarten year a special memory! Whereas the days are meant to be a ton of fun, they are not mandatory. The activities are not meant to bring on any extra work for the adults at home so be creative and use what you have!